“Let your dreams be bigger than your fears and your actions be louder than than your words.” M. Scott Peck. 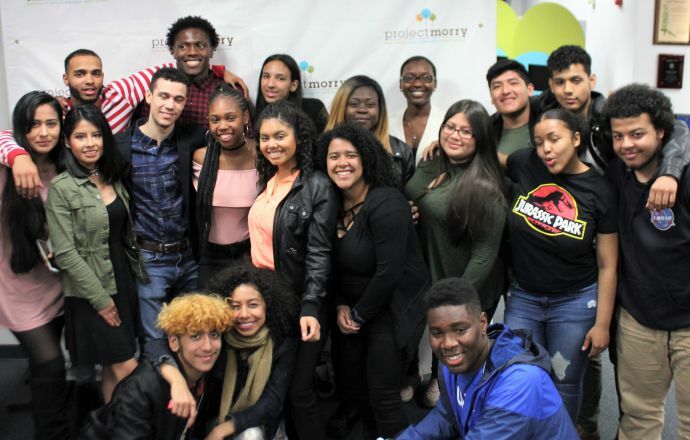 Project Morry celebrated our 2018 Commencement on May 12th with almost 90 students and family members. We are incredibly proud of our 37 graduates from Amityville, Bridgeport, Bronx, Elmsford, Manhattan, and Port Chester who achieved a 100% on-time graduation rate! Congratulations! Project Morry students consistently graduate on time with post high school plans that include college or university or military service. This year our students have been accepted to more than 30 colleges including Drexel University, MIT, Vanderbilt University, University of Buffalo, Seton Hall, University of Connecticut, Long Island University, SUNY Geneseo, Westchester Community College, Johnson & Wales, Mount Saint Mary College,Iona College, and Manhattanville College. 91% of Project Morry alumni who enroll in college complete their degrees. These achievements are especially impressive in comparison to the communities our youth reside in where high school graduation rates are as low as 61%. Nationally only 10% of low income students attend college and nearly 1/3 of all college students, regardless of socio-economic status, drop out of college. Our alumni’s achievements don’t end with their high school or college graduation. They go on to career success in a wide range of fields. Our alumni are teachers, financial analysts, digital media strategists, accountants, photographers, human resource managers, entrepreneurs, marketing managers, arts programming coordinators, and MBA candidates. They stay active in Project Morry and their communities, exemplifying our values of volunteerism, personal responsibility, and leadership. We can’t wait to see what the class of 2018 will achieve. They are well on their way to achieving their dreams! Next: Give Opportunity Change Lives!